Hey guys … I’m looking for some help on identifying this set of coins. I purchased them a year or two ago from a boardie on another forum. I haven’t seen them in a while as they are stored in one of my bank safety boxes but I came across these photos when I was looking through my coin pictures. I’m kind of curious what they are and if they may be of any value? I’m not looking to sell them but just curious if they are worth anything. This is a 1980 Mint Set in black folder. There is also a set in blue folder. I believe the current going market is around $500 to $700. I was scanning Xuhong ebay site to see if I could find a set to compare but saw none. 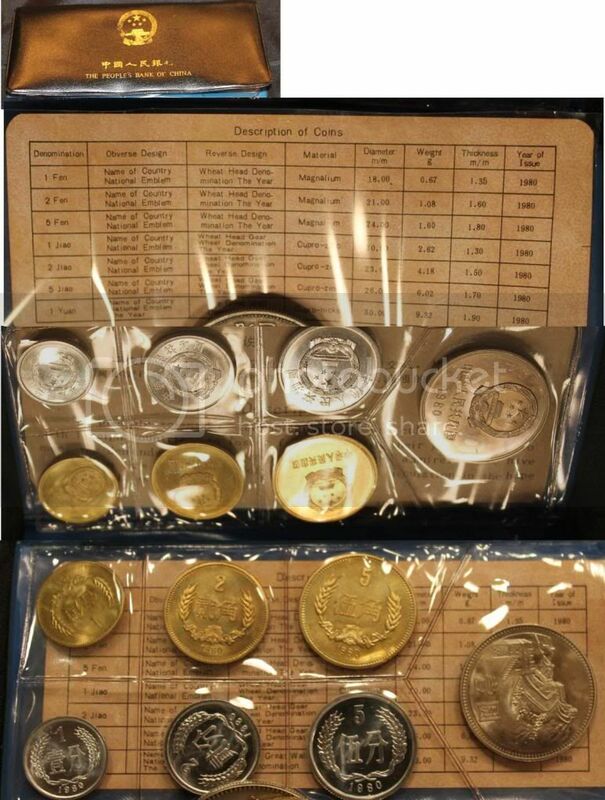 As mentioned by PandaOrLunar, this is 1980 UNC mint set with mintage of 80,000. Here is the link for current value of mint and proof sets. IMO, your set may be worth much more than $700, since all fen coins are in "proof-like" condition. There is no proof fen coins issued in 1980. Is there a way to distinguish proof from the normal UNC? I found a few 1980 loose in my knit knack box. They appeared to be uncirculated. poconopenn thank you for the information and awesome link ! There was no proof 1980 Yuan and Jaio coins issued by China Mint. The mintage is unknown but limited. However, in addition to the coins in the mint folders, they were also bank roll issued in this year. The following link is for the price of all great wall cu-zn and cu-ni coins in UNC original bank roll condition. Please note, no UNC 1982, 1984 and 1986 Yuan and Jaio were issued. Thanks for the link. They are considerably more expensive than I realized. My comment concerning mint vs proof stem from entries in Krause "Standard Catalog of World Coins". It listed 1980 Jiao as having UNC and Proof version. A snippet is attached. I've sold my same set in black folder on Ebay for 825$ a few month ago. I’m digging up some old threads ... are these coins fairy popular? Yes. I've sold one a few days ago,in blue folder only for 700$ to a chinese collector.The folder was in very very bad condition. I don't know,what is the difference between blue or black folder.